For a shining start to the holiday season, join Laudate Singers for A German Baroque Christmas, a glorious and joyful programme sure to delight audiences. Launching Laudate's 2018-2019 main season, A German Baroque Christmas will transport audiences back to the cathedrals of 17th-century Dresden with music by Johann Christoph Bach, Michael Praetorius, Heinrich Schütz, Johann Pachelbel and other greats of the early Baroque period in Germany. 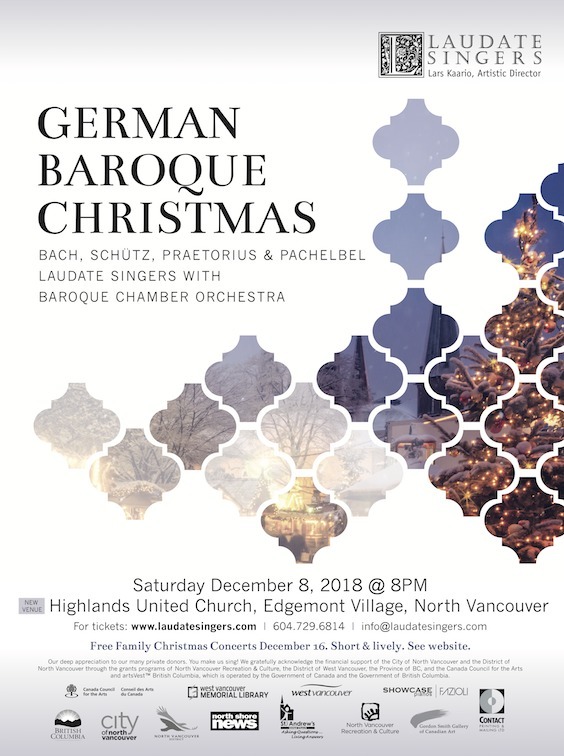 Laudate Singers welcome a guest ensemble of acclaimed Vancouver Baroque instrumentalists Nancy DiNovo, Carolyn Cole, Isabelle Roland, Heather Hay, Anne Duranceau, and Michael Molnar. The audience is invited to enjoy festive treats and meet the artists at the intermission reception.